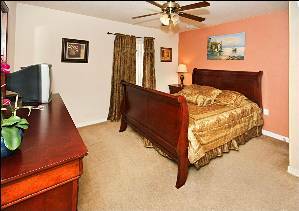 8 miles' drive to the main gate of Disney Parks; minutes away from grocery stores, restaurants, and even post office just off the entrance of the community. WALMART is ONLY 2 miles away opens 24/7. Golf courses are very close by, too. Our villa is located near the intersection of US-27 and 192, offer quick access to all major tourist destinations. Within minutes you can reach all Orlando has to offer. Our villa offers 5BR/3BA with 2 master bedrooms and private swimming pool/spa to enjoy. Luxuriously furnished rooms with all necessary amenities including cooking utensils, and brand-name bedings to name a few. 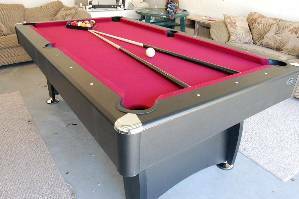 we have a full kitchen, 3 full bathrooms, laundry room, game area (set up in garage) large lanai and generous common area. Three bathrooms and five bedrooms including 2 master bedrooms, with 1 king and 1 queen, 4 twin beds, decorated in different themes; a playpen as well as a queen size airbed for extra 2 guests; all beds are of supreme quality. Six TVs (including 42 inches flat screen TV) in total in the villa, each bedroom has a TV. Each bedroom has its' own theme with accent wall painting & tasteful decoration by the caring owner. 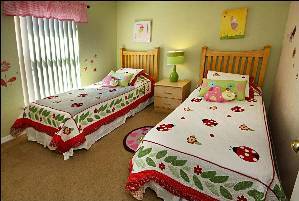 The Lady Bugs Room for girls and Blue Sea's room for boys are dreamland for your kids to sleep at night. Amenities include: Wii, Game Boy, DVD, VCR player. High quality cooking utensils, blender, toaster, plates & cups, towels, linens, etc. Stroller, high chair & crib for baby are also available. BBQ grill is available, too. 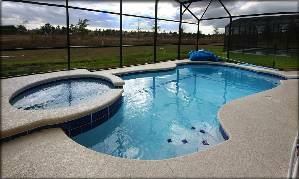 Private south facing pool and spa with patio furniture and safety fence for kids. High Speed wireless internet access at no extra charge! home security system installed in our villa for added security and peace of mind in your most relaxing time. For added enjoyment, the pool backed on to a conservation area gives a feeling of tranquility and peace, as well as a high degree of privacy. For those extra warm days, the covered lanai will provide a welcome shading from the sun.The pool also comes fitted with a child safety fence. Patio furniture is provided. 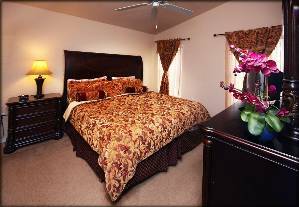 Your vacation will be a memorable one in our beautiful & comfy home away from home! We have a professional and dedicated manager who strives to make our home a comfortable and affordable alternative for your Walt Disney World vacation, 24 hr service available. 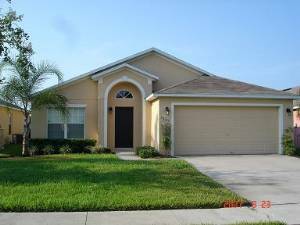 Comment: I would recommend this beautifu home for anyone looking to rent near the Disney, Universal Studios, And Sea World area, or if you rjust looking to get away to the Orlando area. Our family had the greatest time. The property was easy to get to, close to every place we wanted to visit, close to stores, and had all the amentities you could ask for. Comment: Every thing was prefect the was house was one of the best we have rented(we have rented four times with you)all in all this turned out to be a prefect get away for the family. Comment: We had a fantastic experience in the house on Zurieq Ct. The house was roomy enough for our party, the pool was immaculate and the location can't be beat. In a nice neighborhood, this home is only 15 minutes from the park (this estimate INCLUDES traffic). I really liked that we could go to the parks with the kids, come home for a rest, then head back out for an evening at the parks. Because we had a full kitchen and laundry room, we saved alot of money that we would have spent on dining out. I would highly recommend this home for prospective renters! The home was in good shape, and was well stocked with linens and towels -- and the beds were VERY comfy! Comment: We had a wonderful time at your home in Clermont. 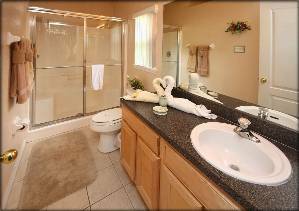 It is a beautiful, very clean and very comfortable home, which is very important to us. My children enjoyed the pool and spa, as did I and my husband. We hope that we can come and stay at your home again sometime in the future. The house was in a perfect location, centrally located, which made it very convenient. Comment: The house was nice and very clean. And Eileen was great to deal with. Everything was there you need and lots of towels. Had a great trip. Comment: The stay was great, we enjoyed coming back everyday taking a swim and relaxing in the hot tub. I will be looking to rent again from you in the future and will tell anyone that will be looking for a place to stay in Fla. It was very easy to find and very close to Disney, that was great. We offer special 10% discount for reservation now between Aug. ¨C Sept 2004 if you become our first new resident for this brand new home. Cancellations and Refunds: Cancellation: security deposit will be refunded in full only if the cancellation occurs at one months prior to the check-in date and not refunded in Less than one month.